We celebrated my husband's birthday this past Sunday with a small dinner for our immediate family. I'd like to brag that I was the one who made the dinner; but I was so busy stressing over the cake that my husband ended up making his own birthday meal. (sorry honey) That's ok, he's a much better chef than me anyway. 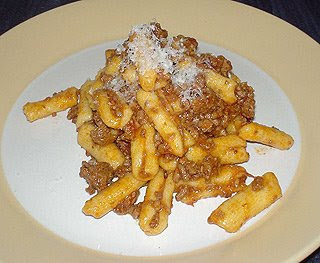 He made a delicious Tuscan Meat and Tomato Ragu served over cavatelli. Cavatelli are a type of pasta, typically about 1¼ inch long, with a rolled edge. They are very similar to gnocchi. The main difference is that traditionally gnocchi are made with potato and cavatelli with ricotta cheese. This sauce is one of our favorites from Lidia's Italy by Lidia Bastianich. It's not hard to make but, like all good sauces, it needs to cook for about 2 hours in order for the flavors to mesh. When I told my husband I would make him any kind of cake he wanted for his birthday; he told me he wanted an Italian Rum Cream cake. I nearly died. My last attempt at making this was such a catastrophe I swore I'd never make it again. 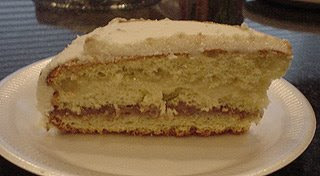 It was 1992 and I decided I was going to try and make an Italian Rum Cake. I got the recipe from a co-worker; who I found out after the fact had never even had rum cake let alone made the recipe she gave me. It was horrible. Not only did it taste bad but it looked a mess. My grandmother was so embarrassed that she went and purchased a cake before anyone had a chance to witness my poor attempt at baking. Fast forward 16 years and I find myself preparing to make this cake again. Can you understand why I was stressing? This time I did a lot of research and pieced together the best recipes I could find for each component of the cake. Although not totally perfect it was much better than my first attempt. Adjust the rack to the lower third of the oven; preheat the oven to 350. Grease and flour a 9″ round cake pan; set aside. Melt the butter in a small saucepan over low heat. Pour into a small bowl; set nearby. Using an electric mixer, beat the eggs, sugar, vanilla and salt in a large bowl until tripled in volume, about 4 to 5 minutes. Fold flour into the mixture, one-third at a time, just until incorporated. Pour about 1 cup of the batter into the melted butter, and fold just until combined. Return the butter mixture into the reserved batter, and again fold to combine. Bake for 20 to 22 minutes, or until the top springs back slightly when lightly touched. Cool for 10 minutes. Run a knife around the edge of the cake, freeing the sides and allowing air to get under the layer Invert the cake onto a rack and cool completely. Makes one 9″ round cake. In large bowl, cream shortening and butter with electric mixer. Add vanilla. Gradually add sugar, one cup at a time, beating well on medium speed. Scrape sides and bottom of bowl often. When all sugar has been mixed in, icing will appear dry. Add milk and beat at medium speed until light and fluffy. Keep bowl covered with a damp cloth until ready to use. For best results, keep icing bowl in refrigerator when not in use. Pour the water into a sauce pan. Add the sugar; stir to blend; then bring to a boil over medium heat. Remove from heat and cool. Can be stored for up to 6 months.